A Jeff Jennings portfolio as a moveable feast, showing stunning panoramas of this rugged Bass Strait island. By JEFF JENNINGS | A sea kayaking trip to Flinders Island in the Furneaux group was my first serious sea kayaking trip in 1983. Since then I have lost count of how many times I have returned to this gaggle of islands as a member of the Maatsuyker Canoe Club. "if you get caught in Moriarty Point maelstrom, you'd best cut your own throat and be done with it … "
Many Bass Strait paddlers unfortunately see the Furneaux group only as a welcome 'stepping stone' to Tasmania. No doubt the same feelings were expressed by the indigenous peoples crossing the land bridge to Tasmania thousands of years ago. 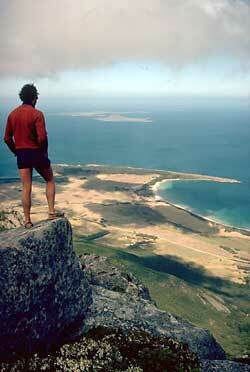 The Furneaux Islands should be seen as a destination in their own right. Thunderous waves crashing against man and kayak have to be reckoned with if you wish to paddle to the Furneaux group. Banks Strait deservedly has a reputation as a place to be feared. Laurie Ford once said to a group of visiting Victorian paddlers "if you get caught in Moriarty Point maelstrom, you'd best cut your own throat and be done with it ". The Reverend Bownrigg in 1880 remarked on how many of the local Straitsmen had, despite their experience in small boats, lost their lives crossing between islands in this area. Two well known Tasmanian river paddlers, Bucirde and Flanagan can tell how they came to close to death after misjudging the fickleness of Banks Strait in 1982. 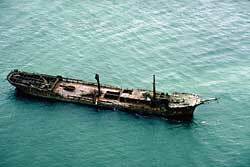 "Get into the bath; switch off the lights, turn the fan on maximum and throw buckets of cold water over us and nobody would know the difference"
A 40-knot nor'-westerly made the crossing to Swan Island in 1998 an interesting experience. Just minutes later, or so it seemed, we were munching our way through a delicious "Swan Island" pizza courtesy of Ken and Sue Stonehouse, caretakers of the island. This became a feature of some of our Banks Strait crossings, but as everyone knows there is a price to be paid. Hours later, in the gloom and spray of South Head on Clarke Island we paid the price for our late departure after a SE change turned placid seas into a nightmare of confusion. "We could re-enact our trip", I said to Rex Brown from Victoria as I poured the water from inside a "waterproof" video housing. "Get into the bath; switch off the lights, turn the fan on maximum and throw buckets of cold water over us and nobody would know the difference." 1995 saw us on Badger Island, a howling NW gale whipped spray from the surface of the water as we gazed across at Mt Strzelecki from Lucy Point. "Could make for an interesting crossing, at least its going in the right direction" said Mick Verrier in his North Sea tourer as we left the shelter of Badger Island. I gingerly panned the video camera across to Mick Verrier and Laurie Ford surging down waves and ploughing into the dark blue waves in front. Minutes later we were up to our shoulders in breaking waves that relentlessly pushed us eastward. Sails up and off we go! 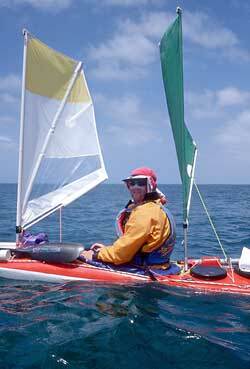 The double sea kayak shuddered as it buried itself into the back of waves. Foam sailed over out heads as Grant Hyland in the rear cockpit strained to keep us from broaching. I gingerly panned the video camera across to Mick Verrier and Laurie Ford surging down waves and ploughing into the dark blue waves in front. "The rudders gone," screamed Grant as the double slewed sideways and we broached. I dropped the video camera while it was still recording and grabbed my paddle to brace as we were swept sideways by the following seas. We couldn't see what had happened but knew something was amiss as Dean's double tried to broach on every new wave. You can guarantee excitement when visiting this area. On another jaunt, with dark skies overhead and howling north west winds chasing us, Mick Verrier, Laurie Ford, Grant Hyland and I surfed and sailed rapidly down Franklin Sound towards Vansittart Island and the wreck of the iron hulled sailing ship the Farsund. 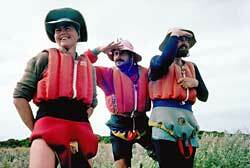 Remember to take your tide tables with you when paddling the Furneaux Islands. With plenty of shoals, narrow channels and strong tides you need to plan routes carefully. 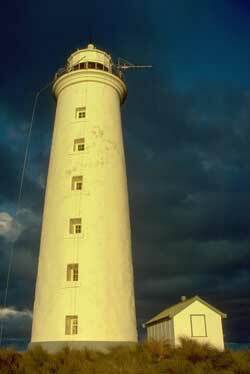 On the South eastern side of Cape Barren Island, at Sea Lion Narrows you can practice ferry gliding and cutting in and out of eddies when the tide races between Passage Island and cape Barren Island. Best not to try it when wind is against tide as the waves become vicious and confused. Yet on another trip in 1999, we sailed leisurely over turquoise seas past Spike Bay and onto the glistening white sands of Rum Island. The image of a tropical paradise was burnt into out consciousness. 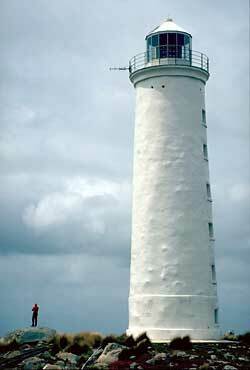 Yet in reality we were off the west coast of Cape Barren Island. A visual paradise, unspoiled, secluded beaches, granite outcrops of every imaginable shape give free roam to everyone's imagination. No wonder convicts, seamen and settlers escaped to this remote locale. Climb the saw toothed Strzelecki Range and take in the panoramic views to mysterious Goose Island lighthouse with its tales of tragedy and spirits of the departed lighthouse keepers and their families. Paddle north around Cape Frankland, if tide and seas permit, and search for Killiecrankie diamonds. and enjoy more Tasmanian sea kayaking adventures.